During our get-togethers with friends, we always discuss about home decor; especially I am crazy about Indian decor. In India, most of our moms decorate our homes beautifully with the crafts for festivals to spread more happiness and positivity in the home. I used to help my mom a lot in my teens to arrange the things and decorate our home .In that process i have learned so many crafts like making some artificial flowers, wall decals with beads and wire, woolen dolls, simple canvas paintings. I consider myself fortunate to learn all those from my mom. I strongly believe that decorating our home with the crafts, decals and arts gives you positive energy and it helps to refresh our minds. Festive times during Ganesh Chaturthi, Varalakshmi Vratham, Dasara, Diwali, Sankranthi we decorate our home in different styles. we do kolams (muggulu) - Indian designs - in front of our doors, and entrance of the doors are decorated with thoranams (a chain of mango leaves) or artificial leaves along with some marigold flower garlands. In these days, artificial garlands are available in various styles in different prices and also brass and silver puja items are used during festival season. Personally, i love crafts that are made of brass. They give more elegance to your pooja room (place for prayers in house). 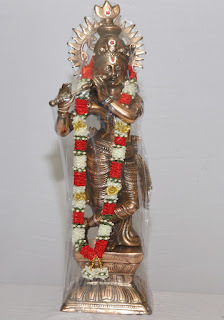 Little Krishna idols with jhula (swing) made of brass is one of my favorites . In so many weddings and in Indian functions, Ganesha idols mesmerize everybody. Bulky brass items like Buddha statues, decorative temple bells, peacocks ,long diyas eventually take you to the traditional mood. In olden days, my grand parents used to cook and eat in brass vessels. Some of them are still in my mom’s place.My mom still uses one brass Vessel to prepare naivedyam (food prepared to be offered to GOD). In so many places, i watched copper OM symbol and Sun God symbol made of copper. They are so graceful on the walls of the living room.Flower and fruit baskets made of copper and other metals are great decals on dining table. Arranging small elephant statues on your study table or media tables increases the attraction. There are many varieties of elephant statues in different metals; not only statues but also elephant wall decals steal many hearts. 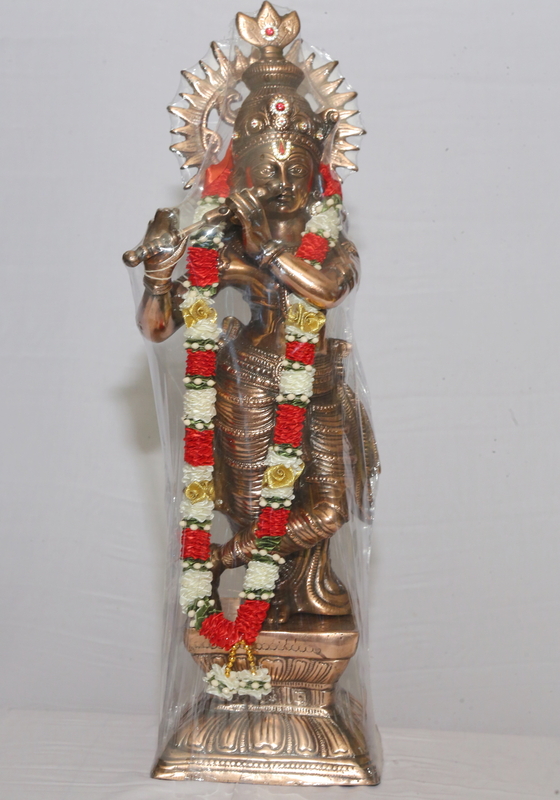 Radha Krishna frames are every one’s first choice to decorate their bed rooms. 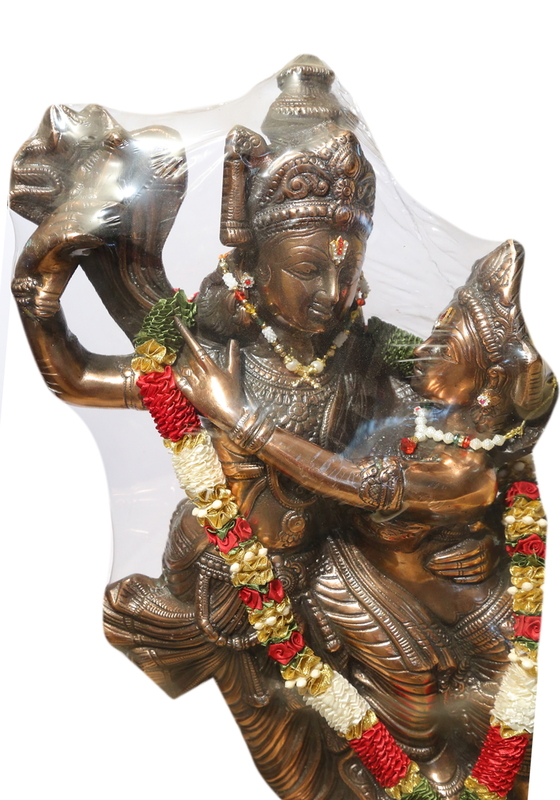 In Indian markets, still unique Radha Krishna statues and frames are being sold every day. Krishna wall decals on canvas are very popular in India. Peacock designs always look beautiful in living rooms.Personally I love antique peacock statues and crafts. India is famous for cotton fabrics. Recently, i visited my friends house; she showed me some collection that she had got from India. I really love cotton table cloths and curtains in variety flower designs. Those are the definitely an enviable pieces. She also mentioned about kalamkari crafts in India. Diwan sets with mirrors are always beautiful .Carpets with kolam designs are so beautiful on the floor of living room. Kondapalli bommalu made of wood are world wide popular crafts . Kids love to place their toys kit, my 4 year old loves to play with them.i bought on wooden Hanuman statue from India.That is her favorite. Door hangings with small elephants, birds, flowers and mirrors are great sign for welcoming visitors. Indian women paintings and village scenic water paintings are special among the Indian diaspora. Ivory carvings are little expensive crafts which are liked by many people. 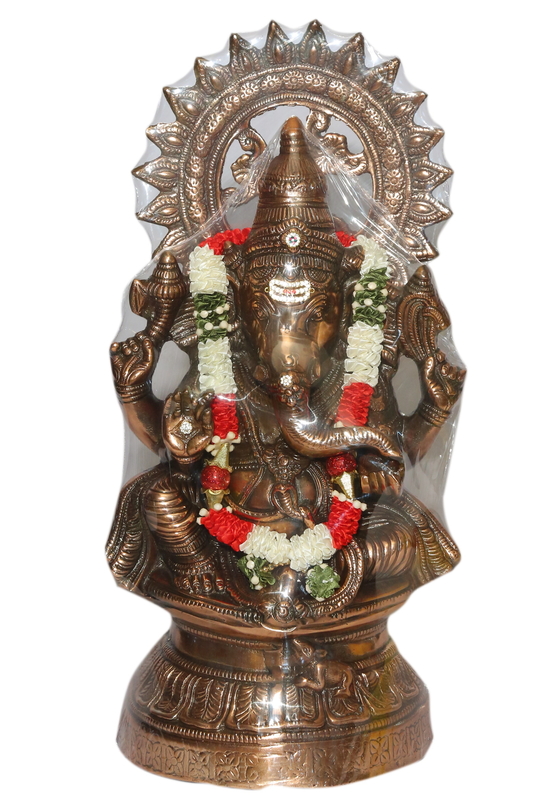 Items like elephants, vases, bracelets, chess sets, Buddha statues, paper knives and animal figures and other decorative objects are very popular. Indian teakwood swings (big swings hanging at the middle of the house), tiger skin carpets are vintage specials which are rarely seen in small or mid-sized modern apartments.